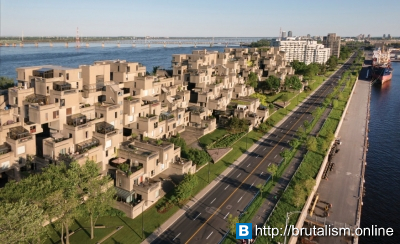 Habitat 67, or simply Habitat, is a model community and housing complex in Montreal, Canada, designed by Canadian architect Moshe Safdie. It was originally conceived as his master's thesis in architecture at McGill University and then built as a pavilion for Expo 67, the World's Fair held from April to October 1967. It is located at 2600 Avenue Pierre-Dupuy on the Marc-Drouin Quay next to the Saint Lawrence River. 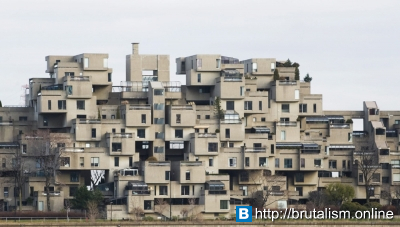 Habitat 67 is widely considered an architectural landmark and one of the most recognizable and significant buildings in both Montreal and Canada. 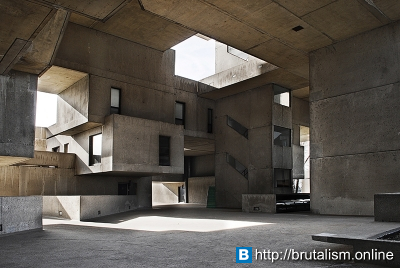 Despite generally being accepted as a structure of Brutalist design, Safdie himself believes the project is "anti brutalist" and "a reaction against brutalism", primarily due to the intentionally more refined finish of Habitat versus the rough or textured finish of typical "béton brut" works. See the video below for Safdie's explanation of this. 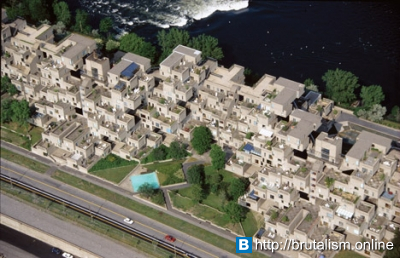 Safdie's design for Habitat 67 began as a thesis project for his architecture program at McGill University. It was "highly recognized" at the institution, though Safdie cites its failure to win the Pilkington Prize, an award for the best thesis at Canadian schools of architecture, as early evidence of its controversial nature. After leaving to work with Louis Kahn in Philadelphia, Safdie was approached by Sandy van Ginkel, his former thesis advisor, to develop the master plan for Expo 67, the world fair that was set to take place in Montreal during 1967. Safdie decided to propose his thesis as one of the pavilions and began developing his plan. After the plans were approved in Ottawa by Mitchell Sharp, the federal cabinet minister responsible for the exhibition, and Lester B. Pearson, Safdie was given the blessing of the Expo 67 Director of Installations, Edward Churchill, to leave the planning committee in order to work on the building project as an independent architect. Safdie was awarded the project in spite of his relative youth and inexperience, an opportunity he later described as "a fairy tale, an amazing fairy tale". The development was financed by the federal government, but is now owned by its tenants, who formed a limited partnership that purchased the building from the Canada Mortgage and Housing Corporation in 1985. Safdie still owns a penthouse apartment in the building. 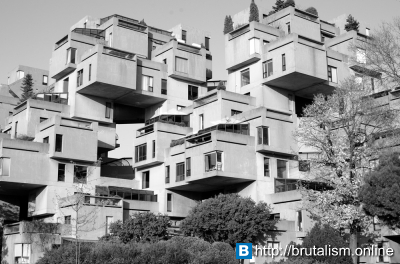 Habitat 67 comprises 354 identical, prefabricated concrete forms arranged in various combinations, reaching up to 12 stories in height. Together these units create 146 residences of varying sizes and configurations, each formed from one to eight linked concrete units. The complex originally contained 158 apartments, but several apartments have since been joined to create larger units, reducing the total number. Each unit is connected to at least one private terrace, which can range from approximately 225 to 1,000 square feet (20 to 90 m2) in size. The development was designed to integrate the benefits of suburban homes, namely gardens, fresh air, privacy, and multilevelled environments, with the economics and density of a modern urban apartment building. It was believed to illustrate the new lifestyle people would live in increasingly crowded cities around the world. Safdie's goal for the project to be affordable housing largely failed: demand for the building's units has made them more expensive than originally envisioned. In addition, the existing structure was originally meant to only be the first phase of a much larger complex, but the high per-unit cost of approximately C$140,000 prevented that possibility. The theme of Expo 67 was "Man and his World", taken from Antoine de Saint-Exupéry's memoir Terre des hommes (literally "land of men", though it was published under the title Wind, Sand and Stars). Housing was also one of the main themes of Expo 67. 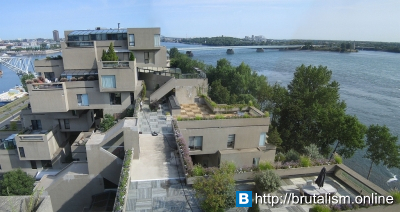 Habitat 67 then became a thematic pavilion visited by thousands of visitors who came from around the world, and during the expo also served as the temporary residence of the many dignitaries visiting Montreal. 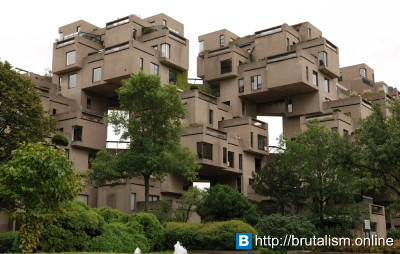 In March 2012, Habitat 67 won an online Lego Architecture poll and is a candidate to be added to the list of famous buildings that inspire a special replica Lego set. Lego bricks were actually used in the initial planning for Habitat; according to Safdie's firm, "initial models of the project were built using Lego bricks and subsequent iterations were also built with Lego bricks”. 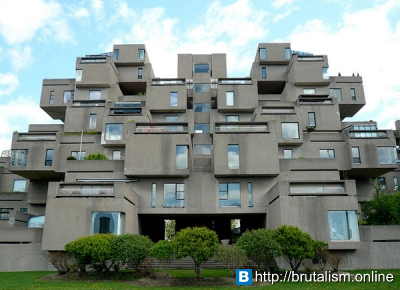 As one of the major symbols of Expo 67, which was attended by over 50 million people during the year it was open, Habitat 67 gained world-wide acclaim as a "fantastic experiment" and "architectural wonder". This experiment was and is regarded as both a success and failure — it "redefined urban living" and has since become "a very successful co-op", but at the same time ultimately failed to revolutionize affordable housing or launch a wave of prefabricated, modular development as Safdie had envisioned. Despite its problems, however, Habitat's fame and success "made [Safdie's] reputation" and helped launch his career; Safdie has now designed over 75 buildings and master plans around the world. Even now, more than 40 years after Habitat, much of Safdie's work still holds to the concepts that were so fundamental to its design, especially the themes of reimagining high-density housing and improving social integration through architecture that have become "synonymous" with his work.